We all age. We all hope to age gracefully. However, we generally need some guidance to make sure that we are aging gracefully. Mindful Aging is the ideal baby boomer guide book for mindful aging. Andrea Brandt’s book gleans many of the practices of mature aging that she teaches in her Andrea Brandt Therapy practice but gears these practices specifically for the baby boomer generation, which is reaching retirement age in droves. Mindful Aging helps you reach your highest potential and find fulfillment as you age and life continues to change in unexpected ways. Find peace of mind as you read Dr. Brandt’s insight into the aging process and find new ways to embrace the life you’re living. 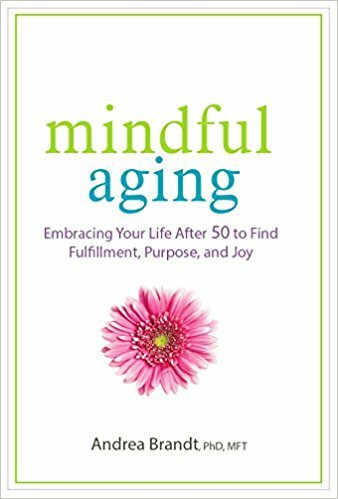 Dr. Brandt’s research guides her inspiring and information baby boomer guide to aging book, Mindful Aging: Embracing Your Life After 50 to Find Fulfillment, Purpose, and Joy. This book provides the essentials to living a healthier and more meaningful life as you age. Your post-middle age does not need to be the beginning of the end, a time to deteriorate and withdraw. Instead, practice mature aging and meet your new stage of life head-on. Mindful Aging presents the tools necessary to grow and heal as you age, reinvigorating you as you go on rather than winding down your existence. Life after 50 is filled with new possibilities. As advances in science and technology increase our lifespan and improve our health, the old age of the past has new meaning. Dr. Brandt’s research and perspective provides insight into finding that new meaning in your own life. Buy Mindful Aging today and learn how you too can age gracefully. Contact Andrea Brandt Therapy at (310) 828-2021 to learn more about her baby boomer guide to aging book and what she can do for you.